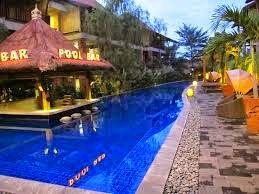 Bali Indonesia has a lot of cheap hotel for a cheap holiday. Cheap hotels is one of the attractions for tourists who are planning a vacation in Bali. Although there are plenty of cheap hotels, but the quality and service provided is not inferior to the five-star hotel. Five-star hotel is known as the hotel with the best service and the best comfort. However, not all cheap hotel has bad service. There are plenty of cheap hotels in Bali have a good quality of service and is able to pamper the guests. Many people are holidaying in Bali are confused by selection for a place to stay. Sometimes they are unsure of the quality of service of cheap hotels in Bali. Indeed there are many cheap hotels with the best quality service. But not everyone knows the names of cheap hotels that have the equivalent of five-star quality. Kuta is the center of tourism in Bali. Kuta has a lot of cheap hotel for tourists who want to vacation with a little money. Almost all places in Kuta has cheap accommodation, but classy like a five star hotel. Kuta is also called as a cheap tourist areas in Bali. 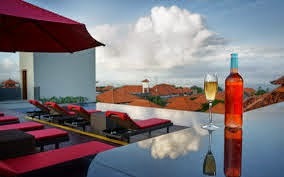 White Rose Bali Hotels & Villas, Address: Jalan Legian, Kuta, Bali 80001, Indonesia, phone: +62 361 756515. Cheap hotels in Kuta has a romantic atmosphere that is visible from the interior design of the building in White Rose Bali Hotels & Villas. In addition, the hotel also has a fairly extensive gardens and is often used for weddings. BBQ dishes accompanied by traditional Balinese dance performances. In addition, the hotel also has a large swimming pool. The hotel is located very close to Bali Blast Monument is located on Jl. Legian. You can reach the hotel is just 10 minutes drive from Ngurah Rai International Airport. Rates per night start from Rp. 698 000. Fontana Hotel Bali, Jl. Dewi Sri No. 68, Kuta, Bali 80361, Indonesia, Telephone : +62 361 8947100. Cheap hotels in Kuta Bali offers a typical atmosphere, with luxury interior decoration. The size of the spacious room with a large bed. The hotel provides the best facilities that will pamper guests while staying. Spa services, massage, swimming, or fitness. In addition, the hotel also provides free WiFi facilities for guests. The location of this hotel is easily accessible, just 15 minutes from Ngurah Rai International Airport. Rates per night start from Rp 630,000. Sun Island Hotel Legian, address: Jl. Legian No. 123, Kuta, Badung, Bali 80361, Indonesia, Telephone : +62 361 8469888. Cheap hotels located in the entertainment center of Kuta, namely Jalan Legian. You will get the comfort and class facilities at Sun Island Hotel, Legian. The staff here are very friendly and ready to serve all the needs of you and your partner. The hotel has a high rating because a lot of getting positive reviews from satisfied visitors who will service the hotel. The hotel has a swimming pool on the rooftop, is perfect for spending time with sunbathing or swimming. You can also enjoy spa services with your partner here. The location of the hotel is close to Kuta Beach and Beachwalk Mall. You can achieve only a 5 minute walk away. 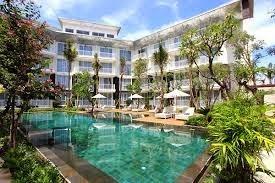 The location is close to Kuta Beach makes it very favorite for couples who are looking for hotels in Kuta at a low price. Rates per night start from Rp 684,000. Swiss - Belinn Legian, Address: Jalan Padma Utara, Legian, Kuta, Bali 80 261, Indonesia, Telephone: +62 361 760300. Swiss - Belinn Hotel is a budget hotel that has a swimming pool located on the rooftop with views towards Kuta Beach. You can swim while enjoying the sunset with friends. Swiss Belinn Legian has a modern minimalist design and is located in the heart of Kuta. You will be greeted with friendliness of the staff and full facilities offered by this hotel. Location of the hotel is located just 5 minutes walk from Kuta Beach and 20 minutes drive from Ngurah Rai International Airport. Rates per night start from Rp 650,000. Grand Mega Resort & Spa, Address : Jl. By Pass Rai No. 234, Simpang Siur, Kuta, Bali 80361, Indonesia, phone : +62 361 767672. This cheap hotel is located in a very setrategis, very suitable for lovers and newlyweds. Guests can enjoy dinner with friends at the restaurant bar near the pool, of course, adds to the romantic atmosphere while on vacation. The facilities offered by the hotel is quite complete. Breakfast, laundry service, fitness, and free WiFi. The hotel location is very close to Mall Bali Galeria mall with a cinema that always show the latest movie. To go to this mall is only a 5 minute walk away. Rates per night start from Rp 614,000.